The Century® C-341 Conformal Coating System is a cost-effective, automated benchtop system for selectively applying conformal coating materials. Patented technology replaces traditional dip, brush, handgun, and aerosol spray systems. 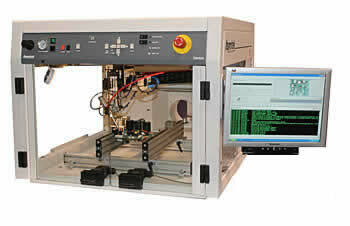 The C-341 system is equipped with Easy Coat® for Windows XP® (ECXP) software, which is uniquely designed for conformal coating applications, and offers coating flexibility beyond generic motion control and dispensing packages. Within a familiar Windows environment, multiple coating commands can be edited simultaneously, minimizing the time required to make programming and pattern changes. Conformal coating log files are configurable, allowing users to record system events and parameters for process improvement and analysis. This benchtop system provides consistent and uniform dispensing of a variety of coating materials. An adjustable fixture to hold PCBs allows for easy board placement and workspace convenience.